New Improved model with over heating circuit protection feature. SIMPLY PLUGS INTO 24V CIGARETTE LIGHTER SOCKET. WITH ON/OFF SWITCH ON THE CIGARETTE LIGHTER. GIVES YOU TWO 12V OUTPUTS WITH TWO 4 AMP IN EACH SOCKETS. 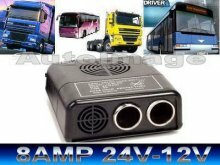 INPUT : 24V DC (max. 30V).